Ras and Rho family GTPases are cytoskeletal small G-proteins that critically regulate multiple actin-dependent cell processes, including development, growth, motility, and intracellular trafficking1,2. Moreover, dysfunction of Ras and Rho family GTPases are correlated with several human diseases (e.g., cancer, neurodegeneration) and these GTPases are targeted by multiple pathogenic bacteria3-5. The GTPase families are comprised of multiple isoforms, including Cdc42 and RhoJ; RhoA, RhoB, and RhoC; and Rac1, Rac2, and Rac3 for the Rho family. The Ras family contains N-, K-, and H-Ras. Given the important role that these GTPases have in physiological and pathological processes, the ability to measure the activity of specific Rho and Ras isoforms is paramount (Tables 1 and 2). Rho and Ras family GTPases cycle between an inactive GDP-bound state and an active GTP-bound state. Traditional small GTPase activation assays utilize an effector protein conjugated to agarose beads to isolate or “pull-down” the activated respective GTPase which is then quantitated by western blotting. 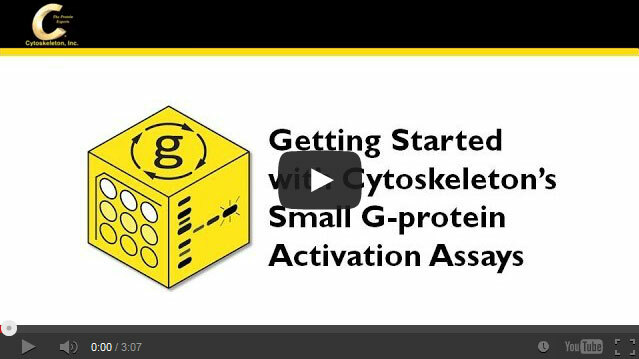 G-LISAs are a second type of activation assay based on ELISA technology which provide a more quantitative, quicker, and sensitive alternative to pull-down assays. Both formats are offered by Cytoskeleton, Inc. and both kit types can be modified to measure the activity of specific Ras or Rho family isoforms (Tables 1 and 2). Importantly, some isoforms (e.g., H-Ras vs K- and N-Ras; RhoC vs RhoA) are expressed at a much lower level than their related isoforms6,7. Because there is substantial variability in expression, detection of the less abundant, activated isoforms can be more difficult. Potential assay variables that might require modification include: lysate concentration, lysis buffer, and antibody concentration and/or dilution, to name just a few. In the examples discussed below, the main modifications were titrating the lysate and isoform-specific antibody. Rho GTPases mediate a variety of physiological and pathological cell functions. Cytoskeleton's RhoA G-LISA was used to study the activity of RhoB in angiogenesis, the formation of new blood vessels from existing vasculature. Angiogenesis requires activation of endothelial cells by growth factors and because RhoB has been shown to regulate the trafficking and function of growth factors8,9, this GTPase was investigated for its role in growth factor-mediated angiogenesis in endothelial cells10. RhoB expression and activity were examined after vascular endothelial cell growth factor (VEGF) stimulation. To measure activity, the RhoA G-LISA kit was modified by substituting a RhoB antibody for the normal RhoA antibody. The authors concluded that VEGF-mediated endothelial cell morphogenesis is dependent upon RhoB and RhoB-mediated inhibition of RhoA activity10. In addition to RhoB, the RhoA G-LISA can also be used to measure RhoC activity. Because RhoC's constitutive activity is correlated with tumor progression, invasion, and metastasis in many cancers, this GTPase is believed to be involved in cancer cell motility11-13. The role of RhoC in the metastasis of prostate cancer to bone was examined using the RhoA G-LISA activation assay kit with the substitution of the RhoA antibody with a RhoC antibody14. Regulators of RhoC activity have also been examined with a report that atorvastatin, an inhibitor of cholesterol biosynthesis, reduces RhoC activity in multiple head and neck squamous cell carcinoma (HNSCC) cell lines15. In a follow-up study, the authors studied expression of microRNA-138 in the same cell and tumor lines and concluded that microRNA-138 negatively regulates RhoC expression and activation16. In both papers15,16, RhoC activity was measured using the RhoA G-LISA, substituting the RhoA antibody with a RhoC antibody. Similar to Rho GTPases, Ras is a GTPase implicated in multiple pathological conditions, including cancer and inflammatory diseases. Recently, Cytoskeleton’s Ras pull-down kit was modified to specifically measure N-Ras activation by substituting the pan anti-Ras antibody with an antibody specific for N-Ras17. The authors investigated the molecular pathways involved in cholangiocyte senescence associated with primary sclerosing cholangitis (PSC), focusing on N-Ras expression and activity level changes in cholangiocytes, the epithelial cells of the bile duct17. The activity of the less-studied GTPase RhoJ, with 55% amino acid sequence homology to Cdc42, can be measured with Cytoskeleton's Cdc42 G-LISA kit18 or the p21-activated kinase 1 protein (PAK)-GST sepharose beads that come with the Cdc42 pull-down kit19. Researchers measured the VEGF-mediated activity of Cdc42 and exogenously-expressed RhoJ in HEK-293T and endothelial cells to better understand the role these GTPases have in pathological angiogenesis underlying various retinopathies. To measure the activity of a specific Ras/Rho isoform, consult the references in Table 1 for the relevant citation. If no citation exists for the isoform to be studied, use the most similar activation assay and titrate the specific primary antibody against activated and non-activated lysates starting with 1:50, 1:100, and 1:200 dilutions. An activated/non-activated set of lysates can be made by growing cells to 50% confluency in serum-containing media, washing twice with PBS, and preparing and storing lysates as directed in the assay manual. Defrost one aliquot and incubate at room temperature for 1 hour to degrade the active GTPase levels, which will be the non-activated condition. An untreated aliquot will be considered activated, which most serum-grown cells are. A second way to prepare activated and non-activated lysates would be to incubate lysates with GTPγS or GDP, respectively, as described in the pull-down assay manuals. These types of assay modifications are not limited to Rho and Ras activation assays. Similar modifications can be applied to study Rac2 or Rac3 activity with our Rac1 activation assay kits, RalB with our RalA activation assay kits, or H-, K-, or N-Ras with our Ras activation assay kits (Table 2). 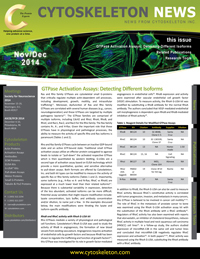 In this way, these assays offer great versatility in the study of GTPase activation. If you have additional questions about using either activation assay format for detection of a specific isoform, please contact Cytoskeleton's Technical Support at tservice@cytoskeleton.com or 303.322.2254. A.B. Jaffe and A. Hall. 2005. Rho GTPases: biochemistry and biology. Annu. Rev. Cell Dev. Biol. 21, 247-269. S.J. Heasman and A.J. Ridley. 2008. Mammalian Rho GTPases: new insights into their functions from in vivo studies. Nat. Rev. Mol. Cell Biol. 9, 690-701. N. Kasri Nadif and L. Van Aelst. 2008. Rho-linked genes and neurological disorders. Pflugers Arch. 455, 787-797. F.M. Vega and A.J. Ridley, 2008. Rho GTPases in cancer cell biology. FEBS Lett. 582, 2093-2101. K. Aktories. 2011. Bacterial protein toxins that modify host regulatory GTPases. Nat. Rev. Microbiol. 9, 487-498. J. Omerovic et al. 2008. Ras isoform abundance and signalling in human cancer cell lines. Oncogene. 27, 2754-2762. K.L. van Golen. personal communication. M. Huang et al. 2011. RhoB links PDGF signaling to cell migration by coordinating activation and localization of Cdc42 and Rac. J. Cell Biochem. 112, 1572-1584. A. Gampel et al. 1999. Regulation of epidermal growth factor receptor traffick by the small GTPase rhoB. Curr. Biol. 9, 955-958. G.A. Howe and C.L. Addison. 2012. RhoB controls endothelial cell morphogenesis in part via negative regulation of RhoA. Vasc. Cell. 4:1. E.A. Clark et al. 2000. Genomic analysis of metastasis reveals an essential role for RhoC. Nature. 406, 532-535. H. Suwa et al. 1998. Overexpression of the rhoC gene correlates with progression of ductal adenocarcinoma of the pancreas. Br. J. Cancer. 77, 147-152. K.L. van Golen et al. 2002. Reversion of RhoC GTPase-induced inflammatory breast cancer phenotype by treatment with a farnesyl transferase inhibitor. Mol. Cancer Ther. 1, 575-583. C.L. Hall et al. 2008. Type I collagen receptor (a2b1) signaling promotes prostate cancer invasion through RhoC GTPase. Neoplasia. 10, 797-803. M. Islam et al. 2013. Atorvastatin inhibits RhoC function and limits head and neck cancer metastasis. Oral Oncol. 49, 778-86. M. Islam et al. 2014. Down regulation of RhoC by microRNA-138 results in de-activation of FAK, Src and Erk1/2 signaling pathway in head and neck squamous cell carcinoma. Oral Oncol. 50, 448-456. J.H. Tabibian et al. 2014. Cholangiocyte senescence by way of N-Ras activation is a characteristic of primary sclerosing cholangitis. Hepatology. 59, 2263-2275. Y. Fukushima et al. 2011. Sema3E-PlexinD1 signaling selectively suppresses disoriented angiogenesis in ischemic retinopathy in mice. J. Clin. Invest. 121, 1974-1985. S. Kusuhara et al. 2012. Arhgef15 promotes retinal angiogenesis by mediating VEGF-induced Cdc42 activation and potentiating RhoJ inactivation in endothelial cells. PLoS ONE. 9:e45858.